It is copyright © Hester Knibbe and John Irons and Jacket magazine 2010. See our [»»] Copyright notice. was a place built to live. and where it might be going. searched for you with hope in my bones. Tonight I had a child, but only just. beside me, tall, comforting instead. Hester Knibbe (Harderwijk, 1946) lives since 1972 in Rotterdam, the Netherlands. Her debut was the poetry book ‘Between gestures and words’ in 1982. This debut was followed by, among others: ‘A shirt of flesh’ (1994, nominated for the VSB-poetry prize), Anti-death (1999), ‘ Disturbed ground’ (2002), ‘The flexibility of stone’ (2005), and ‘Treacherous days’ (2008). For her poetry book ‘Anti-death’ she was awarded the Herman Gorter Prize in 2000, in 2001 she was awarded the Anna Blaman Prize, and in 2009 the A. Roland Holst Prize. 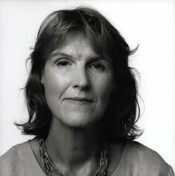 She has published in various magazines and anthologies and took part in poetry festivals in the Netherlands and abroad.